To beat cancer, early detection is crucial. Now, a team of Japanese and American scientists has revealed extremely thin sensors that could one day be built into skin-tight, tumour-detecting gloves for doctors, who can share digitised findings with other physicians. 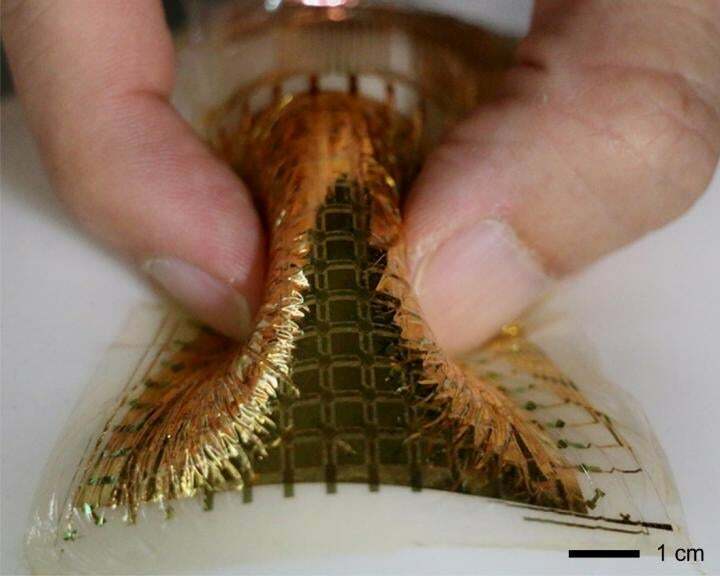 Lots of scientists are currently interested in flexible electronics, since those materials can lead to non-invasive, super accurate, wearable sensors. And while we’ve figured out how to make tiny sensors actually bend, we haven’t made them able to accurately measure pressure, since the sensors became distorted and ineffective the more they got wrinkled. But this new research, published this week in the journal Nature Nanotechnology, suggests a leap forward. The team behind this project included scientists from Harvard and the University of Tokyo. Using organic transistors and electronic switches made from organic material like carbon, the team crafted pressure-sensing nanofibres, and entangled them to make a grid-like, porous, light structure. The result is pressure sensors that are eight micrometers in thickness which is thinner than cling film. They could easily wrap around your fingers, and can conform to the shape of doctors’ hands, and measure pressure of 144 locations at once, helping docs determine if what they’re palpating is a tumour. What’s more: These sensations can be digitised and shared as records to other physicians in follow-up exams, so they have a better idea of what lumps and bumps to be on the lookout for.